The need for whistle maintenance comes mainly from moisture buildup in the whistle from playing. A secondary need may arise from the opposite direction, drying out from long term storage. The answer to first need is drying the whistle bore following a playing session where you can observe moisture adhering to the whistle bore. To see what I use to dry the bore , I'll refer to the lower right photo. The high tech device consists of a rolled piece of soft cloth attached to a length of string. Just drop the string thru the tube bore and pull it thru several times. To address the long term needs of protection (including the less likely drying out issue), we need to apply a sealant to the whistle bore. I apply the sealant with the second high tech device shown in the photo. It is a shotgun swab (.410 gage for my 1/2 inch bore whistles) attached to a length of wooden dowel. 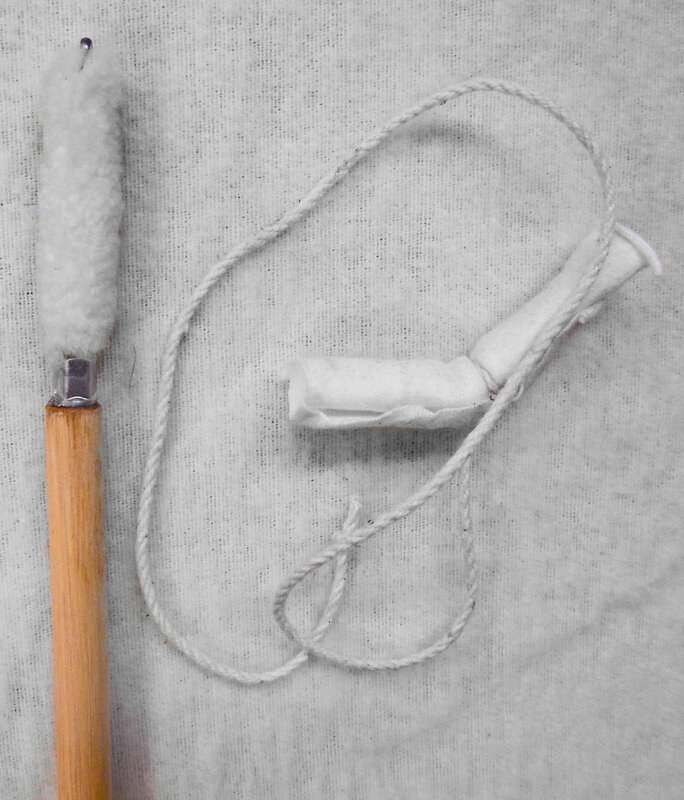 If interested in using such a device, the swab can be obtained from the following online: " http://www.thefind.com/sports/info-gun-cleaning-swabs-shotgun". This application need not be performed following each playing of the whistle and the frequency of application is up for grabs. I feel that once a month for those that play a lot and once every 3 to 4 months is adequate for those who play less. To cover the sealants I use, refer to the upper 2 photos. The second photo shows the type of sealant I use. They are simply the bore oils sold at most music stores who handle band instruments and are used for such instruments as clarinets. . There are many brands out there, the 3 shown here are somewhat representative of what is available. 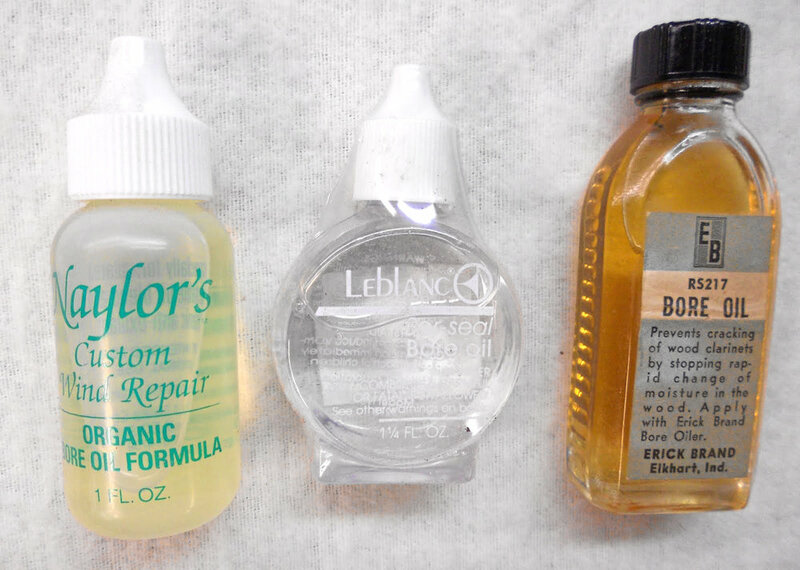 I use the middle bottle (made by LeBlanc) and provide one with each instrument I sell if the buyer cares for one. The bottle of "Butcher Block Conditioner" shown the top photo may prove a little more problematic to some but it is what I use as the final step in coating the whistle bore after building. I wanted something that was a more long term coating for the first application of a sealant. The conditioner is food grade so it offers no health issues and is quite odorless. I feel it provides a more long lasting seal than the lighter instrument bore oils. I apply it using the same high tech shotgun swab. Having outlined all of the above, I will offer an even more arguable solution to the moisture problem. Don't play wooden whistles! As I have stated in an earlier post, I feel that the material used in the construction of the whistle (excluding metal whistles) has very little, if any, effect on the sound of the whistle. While as a builder of stringed instruments and furniture, I am a great fan of the beauty of exotic woods but feel they are less than ideal for whistles because of the moisture retention problem. I feel that whistles constructed entirely of Delrin polymer (the material I use for all of my mouthpieces) or with a Dymondwood tube and Delrin mouthpiece are pretty much free of any moisture problems. Dymondwood is wood/polymer composite consisting of many layers of very thin wood veneers and epoxy cured under high pressure and temperature. The impregnated epoxy in the wood seals it from moisture retention problems. As an aside, the wood veneer can be dyed many different colors which can provide a rather striking overall visual effect. Well, that pretty is much where I stand on whistle maintenance, let me know your feeling and concerns and any different ideas you might offer.